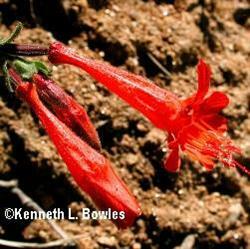 The Epilobiums were previously known as Zauschneria and are still still frequently referred to as such. This Fuchsia is a perennial with showy red-orange flowers that attract hummingbirds. It is a much branching, mounding shrub with slender stems and leaves that tend to be grayish at maturity. Not only does this plant have a spectacular flower show but it also looks amazing in containers, if it is pinched back strategically to a desirable shape. It is drought tolerant and cold tolerant. Easily one of the most beautiful native plants and blooms much later than most species. Mine started flowering in September, is still flowering in December, and just started to produce seed. Lovely foliage even when it isn't blooming; highly recommended.